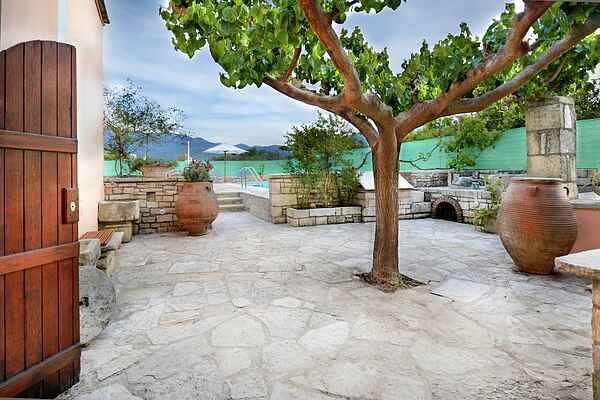 Built in 1871 in a quiet picturesque street of the village and just 150 meters from the main square, Villa Roula is an authentic Cretan traditional stone build villa fully renovated. The three wooden handmade staircases lead to the three autonomous lofts, which are the bedrooms of Villa Roula, with traditional Cretan décor and wooden floors. Traditional family heirlooms and accessories have been placed inside the villa with care, providing the authenticity, the history and the culture of Crete. The wooden ceiling, in combination with the stone walls and the traditional roof, provide a pleasant cool atmosphere during the summer and pleasant warmth during the winter period. The enclosed traditional courtyard with its wonderful fragrant garden, planted organic products and wonderful views ensure absolute privacy and security of svisitors. The old grape press and distilling boiler, constitute the comparative advantage of Villa Roula as these were used for the production of wine and tsikoudia, from grapes of the family vineyards. Unique experience in the harvest period to participate in the wine and tsikoudia process.